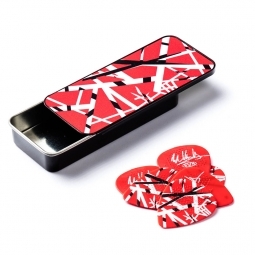 Save over $20 on this is a COMPLETE SET of ALL 5 of the EVH Graphic Series Pick Tins. 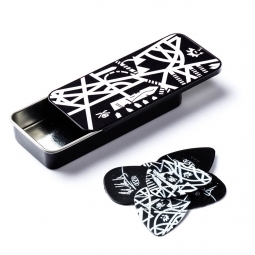 The graphic artwork on these picks is sourced from Eddie Van Halen's iconic guitars. 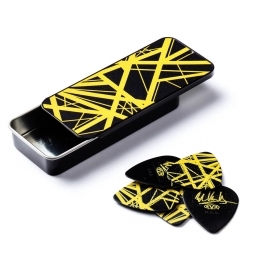 These are the exact guitar picks Eddie uses, Dunlop Max-Grip .60mm gauge picks. 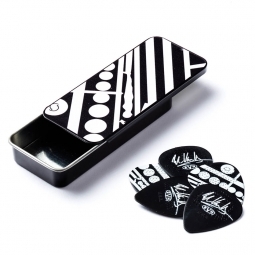 The Dunlop Max-Grip molded grip pattern is the perfect solution for fleet-fingered players looking to achieve perfect precision and speed. 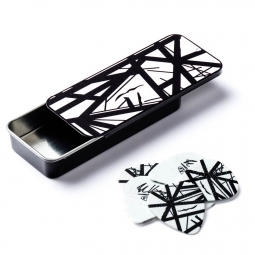 Each pick features a special non-slip surface, ensuring a firm grip and maximum control for strummers and shredders alike.